A breathtaking reproduction in high-quality resin of an authentic Japanese statue, this Buddha sits contentedly in peaceful meditation. His hands are folded in a style unique to Japan and associated with Amida, the Buddha of Infinite Light. 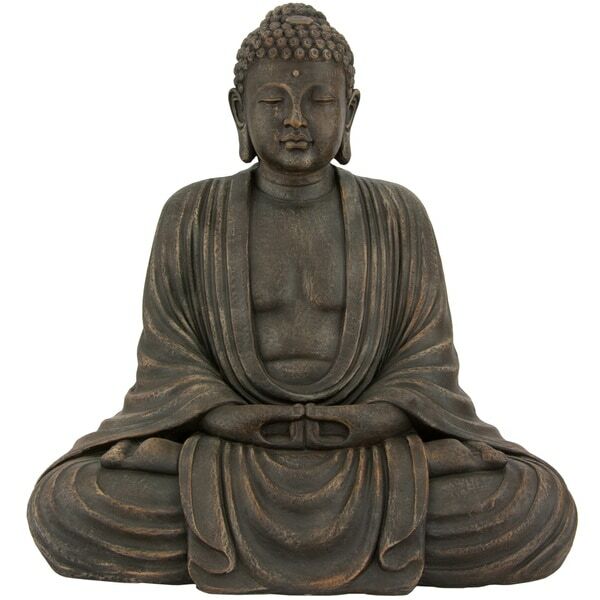 Featuring a substantial size--well over two feet tall--and a beautiful faux patina finish with an authentic stone appearance, this Buddha is a delight to behold and is perfect for a home, yoga studio, restaurant or garden. This handcrafted item comes from a third-generation, family-run workshop in mainland China. Their skills of hand-painting, hand-rubbed lacquering, and hand-tooling have been passed down for many generations. We are proud to support them in their quest to keep their age-old techniques alive for future generations. Many of the artists are hired out of semi-retirement to work from home training the next generation to become master craftsmen. These masters are highly respected in their craft and their culture which have survived through many Chinese dynasties and continue to produce valuable and desirable pieces for your home decor. Exterior finish chips off just from the rain . . . I loved this statue - but after only 3 months outside (in a fairly sheltered location) the "patina" finish is chipping off, and underneath the statue is bright white. It looks awful. I gave this as a very expensive gift, and its embarrassing to see it just a few months later. There is no warranty because it comes from a very small family operation in China. Overstock did offer a small credit so I could go buy some paint to try to cover over the white patches, but I have little hope this will work as it is a unique finish. Can't recommend this to anyone - who wants to spend over $* on something that lasts less than 4 months? Received damaged but overstock immediately repalced the statute. Great service! "In the above illustration, the statue seems to have a series of scratches under the right eye. Do all of the statues have his defect, or only the one shown in the ad? Thank you. Isaiah"
"how much does it weigh & what is it made of?" This statue is weighs approximately 20.5 pounds and is made from resin with a faux patina look. "Will this statue take out door cold weather? Thanks"
Hello Iquest, this item is suitable for outdoor use as well .Please feel free to contact us again with any further questions. Thank you for shopping with us!